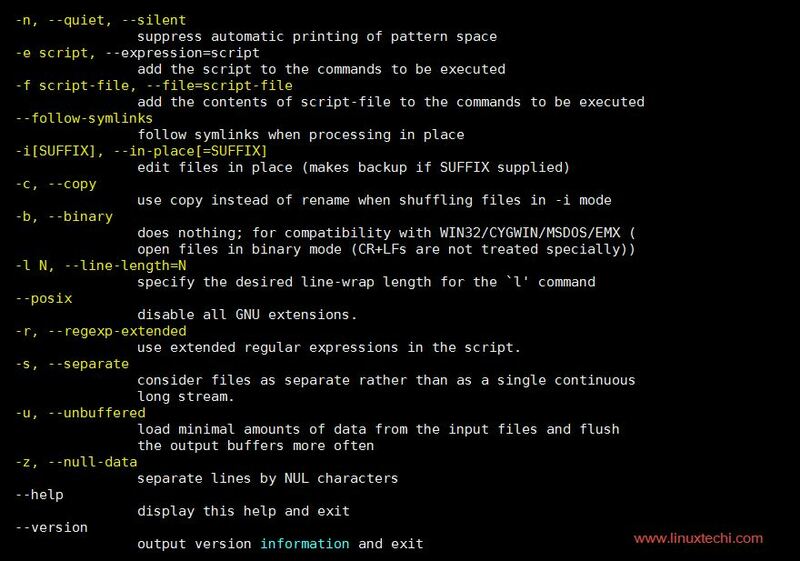 Sed command or Stream Editor is very powerful utility offered by Linux/Unix systems. It is mainly used for text substitution , find & replace but it can also perform other text manipulations like insertion, deletion, search etc. With SED, we can edit complete files without actually having to open it. Sed also supports the use of regular expressions, which makes sed an even more powerful test manipulation tool. here, option ‘n’ suppresses printing of whole file & option ‘p’ will print only line lines from 22 to 29. Option ‘d’ will remove the mentioned lines from output. This will delete lines 29 to 34 from testfile.txt file. here ‘!’ option is used as not, so it will reverse the condition i.e. will not delete the lines mentioned. All the lines other 29-34 will be deleted from the files testfile.txt. here option ‘s’ will search for word ‘danger’ & replace it with ‘safety’ on every line for the first occurrence only. So when the pattern matches ‘danger’, whole line will be changed to the mentioned line. This will create a backup copy of the file with extension .bak. You can also use other extension if you like. This will delete the line with ‘danger’ on start & ‘stops’ in the end & it can have any number of words in between , ‘. *’ defines that part. So now every line will have ‘testing sed’ before it. a complete list all usernames will be generated on screen as output. ‘sed -i’ command has been known to remove system links & create only regular files in place of the link file. So to avoid such a situation & prevent ‘sed -i‘ from destroying the links, use ‘–follow-symklinks‘ options with the command being executed. These were some examples to show sed, we can use these reference to employ them as & when needed. If you guys have any queries related to this or any article, do share with us. example for Remove the nth occurrence of string pattern?? ?